Wide, slip-resistant steps and rugged aircraft-grade aluminum construction for comfort and stability. Slim profile (5 ½ inches wide) for easy storage. The Little Giant Safety Step is a unique combination of strength and simplicity. The Safety Step is constructed with super-strong, lightweight aerospace-grade aluminum; and its wide, slip-resistant steps give you unmatched comfort and stability. The Safety Step 4-Step operates so easily that you can open and close it with one hand, and its slim storage depth (5 ½ inches) will let you store it just about anywhere. 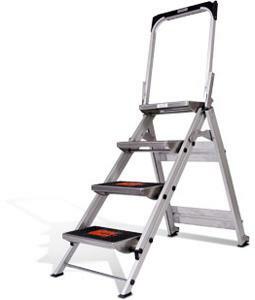 It’s also made for professional and industrial use; in fact, the Safety Step is rated to hold up to 300 lbs on each step. This tough, compact stepladder can handle just about any task, from the lightest house choir to the heaviest industrial job. Finish any household job in comfort and stability with the Safety Steps wide, slip-resistant step's and rugged aircraft-grade aluminum construction. Save space and time: fold the easy-to-use safety step with one hand and store in only 5 ½ inches of space.